U.S. airstrike reportedly kills dozens of civilians in Syria. Again. People stand by as Syrian civil defense volunteers, known as the White Helmets, dig through the rubble of a mosque following a reported airstrike in the village of al-Jineh in Aleppo province on Friday. Another U.S.-led coalition airstrike has reportedly killed a large group of Syrian civilians, this one on Tuesday night at a school sheltering displaced people in Raqqa province, near ISIS’s de facto capital. At least 30 people were killed according to local activists, many of them families who had fled from fighting in other parts of Syria. The Pentagon says it will investigate the allegations. Fighting is escalating around Raqqa, where an increasing number of U.S. troops have joined Turkish, Kurdish, Russian, Syrian government, and Syrian rebel forces in the area, eyeing each other almost as warily as they are eyeing nearby ISIS positions. In a separate operation, U.S. special forces reportedly airdropped in to attack ISIS positions near Raqqa on Wednesday. 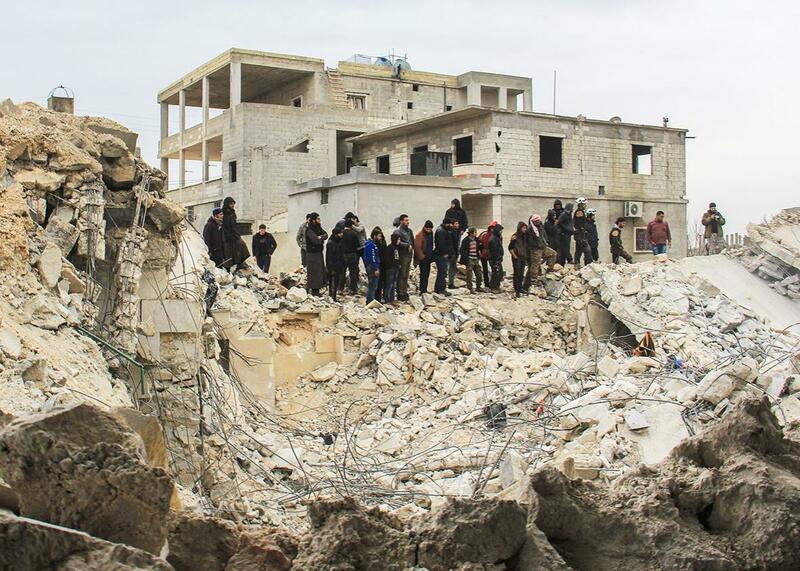 News of the latest alleged mass civilian casualty incident comes as the military announced it has launched a formal investigation into another airstrike that reportedly killed dozens of civilians at a mosque in northwestern Idlib province last week. The U.S. Central Command is looking into both reports from local activists that as many as 49 civilians were killed and whether the building that was hit was actually part of a mosque, as locals claim. Officials have said they targeted an al-Qaida meeting site near a mosque. Tuesday’s airstrike—the second alleged incident of this type in one month—will and should raise questions about whether the U.S. is taking adequate precautions to avoid civilian casualties. This year has seen a dramatic increase in the number of civilians killed by U.S. airstrikes in Syria and Iraq, and, according to data collected by the monitoring site Airwars, civilians killed in U.S.-led coalition strikes exceeded those killed in Russian strikes in both January and February. Of course, civilians were killed in airstrikes under the Obama administration too, and the uptick in civilian deaths preceded Trump taking office. But the new administration has also taken a number of steps that could put more civilians at risk, including instructing the Pentagon to loosen rules of engagement for anti-ISIS missions to the minimum required by international law (a move one former U.S military intelligence officer has described as “really fucked up”); giving the military more latitude to order operations without White House review; and giving the CIA new authority to conduct drone strikes, which have a lower level of transparency and accountability than those conducted by the military. Trump had campaigned in part on the notion that the Obama administration was being too “politically correct” in the fight against ISIS and suggested deliberately killing the families of terrorists. We thankfully haven’t seen anything like that yet, but that’s not good enough. International humanitarian law requires militaries to take “all feasible precautions” to avoid civilian deaths, a standard that also came up in the investigation of the 2015 U.S. bombing of a Doctors Without Borders hospital near Kunduz, Afghanistan. Jonathan Horowitz, a legal officer at the Open Society Justice Initiative, told me that, whether or not the two airstrikes met the “all feasible precautions” standard “depends heavily on what was happening on the ground and how much the military operators knew and how strong their efforts were to distinguish between things military and things civilian.” That will hopefully become more clear as these incidents are investigated, though Horowitz does say that the Trump administration’s recent policy changes “really call into question whether they are taking all feasible measures” to protect civilians. After the botched Yemen raid in January, I predicted that liberal Americans might start to look more critically at the humanitarian consequences of U.S. counterterrorism operations, something they often gave Barack Obama a pass on. This might have been too optimistic, as these airstrikes have gotten relatively little attention amid an admittedly crowded news cycle. But as the campaign against ISIS escalates, and if incidents like this continue to occur, it’s essential for the public to finally ask tough questions about what the U.S. military is doing to avoid killing innocent people.